In early spring, Northern California is abloom. Vast fields of canary yellow wild mustard, or the dappled white and lavender of wild radishes, brighten up our lives as our days grow warmer and the light lingers longer. Yes, these are, to most people, weeds. Not to me. To me they are one of the most bountiful harvests of the year — only to enjoy them, you must catch these “weeds” at precisely the right moment. This is that moment. Depending on where you look, you can now find wild mustards and radishes — from a cook’s perspective there is no real difference — anywhere from full leafing out to full flower to just setting out flower buds. And if these flower buds look surprisingly like the rapini or broccoli rabe you buy in the store, that’s because they are the exact same thing. I can’t remember exactly when I first had rapini, or broccoli rabe, which I often see spelled broccoli raab for some reason. I am sure it was back in New Jersey sometime in the 1980s. It looks like spindly broccoli florets, but it isn’t. All are brassicas, yes, but over the centuries seedsmen have bred all the pungency out of broccoli. Rapini, on the other hand, retains that mustardy punch. I dig that punch. A lot. You want to pick the buds of wild rapini before they’ve opened, although it’s OK if a few are turning yellow or white or purple. This one on the right is a wild radish; note the purple flower. I am assuming you know what mustard greens look like. If not, go to any supermarket — they look the same. Another tip-off is the flower: All brassicas have four-petaled flowers. They are also called cruciferous vegetables for this reason; the flowers reminded whoever named them this, long ago, of The Cross. 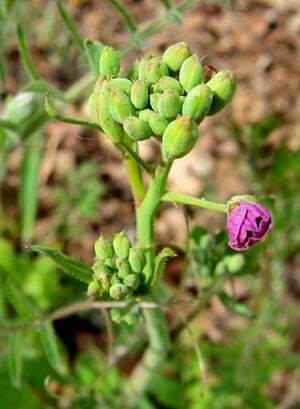 When you find a patch, pick the buds about 6 to 8 inches down the stem. You’ll only eat the top 4 to 6 inches, but it’s nice to have a little extra leeway; this also helps keep the buds fresh. You’ll want about a quarter pound per person for a normal dish, although I’ve eaten a half pound all by myself. Normally by the time wild rapini is ready, the weather is in the 60s or even early 70s, which will do a number on tender greens. Keep them in the shade and in paper or cloth bags — plastic will make them sweat. Then, as soon as you get home, fill a large container, like a big plastic Tupperware or bowl, with ice water and soak the rapini (or mustard greens) in it for 30 minutes. They will emerge crisp and refreshed. Shake them to get the excess moisture off, then put them in a plastic bag with a paper towel set inside; the towel absorbs excess moisture. Close the bag and the rapini or the greens will last up to a week this way — although they are never better than when just picked. One more important note: While you will still see wild rapini when the weather warms, they will get impossibly bitter and pungent once your daily temperatures are in the 80s or higher. Wild rapini is a springtime treat, although you will sometimes get a smaller harvest in fall before the snow flies. 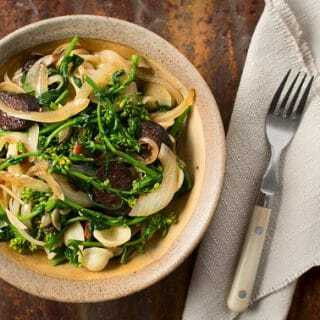 In stir fries, sauteed in butter or oil, chopped in an omelet, in a Greek pie like spanakopita, as a side dish to meat or fish (rapini is especially good alongside freshwater fish), or as the star in a pasta dish. What follows is my take on a very traditional Southern Italian recipe for orecchiette pasta and rapini. This is one of those “quick and easy” dishes you don’t often see on this site. Enjoy! 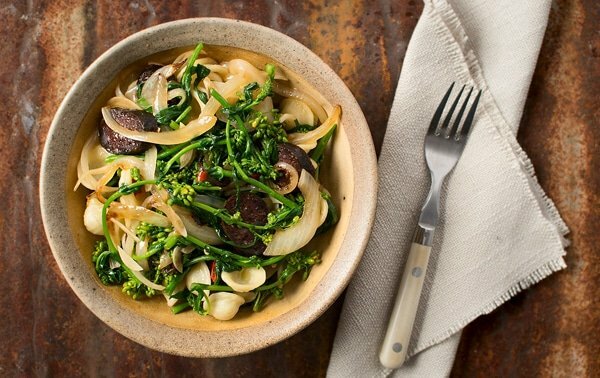 This recipe can of course be made with store-bought rapini, which is virtually identical to its wild cousin. Orecchiette is a typical pasta shape for this dish, but you can use any short pasta here. Fusilli or gemelli are good alternatives. This recipe is good either hot or at room temperature. This first step is optional, but it make the rapini prettier. Bring a large pot of water to a boil and salt it heavily; it should taste like seawater. Set up a bowl of ice water nearby. Boil the rapini for 90 seconds, then plunge into the ice water to stop cooking. This sets the jade green color. Either way, you need the boiling water for the pasta, so you might as well do it. Once the rapini has been blanched, add the orecchiette and cook until al dente. Use this time to chop the onion, garlic and salami, if using. Drain the pasta and toss with a little olive oil. Set aside. Heat the 2 tablespoons of olive oil in a large saute pan set over high heat. The moment it begins to smoke, add the onion and toss to combine. Sear the onion until you have some caramelized edges, stirring only every minute or so. Turn the heat down to medium-high and add the rapini, garlic, chiles and salami. Toss to combine everything. Saute for 2 minutes, then add the pasta and saute another minute, stirring often. Turn off the heat and add the lemon juice and black pepper. You can drizzle a little high-quality olive oil over the dish right when you serve, too. 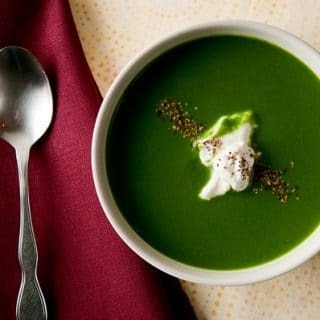 You can find all sorts of recipes for greens both wild and domestic, here on Hunter Angler Gardener Cook! Nick: Fascinating! I had no idea that older broccolis had that mustardy flavor. Good to know. You know one thing I like best about your blog is that I come away a little bit smarter when I read it. And, I think my appreciation of rapini just skyrocketed. Thanks Hank.